You are a brave soul for choosing to read my first ever blog post. It's not perfect, but I must remember that one has to start somewhere, and that place is here. My hope for this blog is that I might offer a glimpse into both the beauty and challenges of starting a small business. In the world of filters and cropping, it's easy to believe that some people just have it all together, living the perfect 200x200 pixel life with their homemade bread and kombucha and perfectly clean house and photogenic children. I hope this space will help us both remember that there is gritty behind the beautiful, and that creating art, in every sense, is a process about patience, failure, and perseverance. Along with all that, this will also be a place for me to share the daily doings of life at our home here in Arkansas; things like gardening, cooking, and budgeting (because there aren't enough blogs about those things already, ha!). So, thank you for being here. Now pull up a chair, grab some coffee, and I'll tell you a story. This is our house. It's on a street called Willow in a lovely town called Fayetteville. My husband (Dan) and I moved here in August of 2013, about three months after we got married. We found this place on Craig's List, and arrived sight unseen. I immediately loved it. It has its quirks to be sure (more on that later), but it's a gem of a place and we're still here almost four years later. We moved so that Dan could begin the process of getting his PhD in History at the University of Arkansas. Before Fayetteville, we lived in a small town called Blacksburg, in the southwestern part of Virginia. I lived there most of my life, since I was eight. All of my friends were there, my life was there, pretty much everything I knew was there. As excited as I was to start a new adventure with my new husband in a new place called Arkansas, leaving Blacksburg was hard. It was moving day, Dan drove the U-Haul, and I drove our car. As I played Josh Garrels on repeat and drove across the endless state of Tennessee, I wept. This all sounded like such a great plan only days ago, but now it was real and it was 99 degrees and I was leaving everything I loved to live in ARKANSAS. Well I won't bore you with the rest of all that, but long story short, it didn't take me long to get past the weepy phase and realize that Fayetteville was actually a pretty great place and moving here was the best thing we could have done. I'll tell you more about that another time. Anyway, I came here without a job and had a bit of extra time on my hands. Back in Virginia, I was an intern at an architecture firm. It was a good job and I had a great boss and coworkers, but I didn't love the experience of working in a firm. The 8-5 schedule always made me feel trapped and creatively stifled. There was probably a lack of maturity on my part in that, but I just never felt like myself in an office setting. Architecture school was another story. It was creatively invigorating, challenged me to think, and showed me how to see like a designer. That education is what prepared me for May We Fly, I just didn't know it yet. A thing I drew in architecture school because I was crazy. Despite my disappointment in the office job experience, I did hope to find an architecture job here in Fayetteville. As I waited for that, though, I needed something to occupy my time with outside of filling out job applications. So, I started drawing. I loved drawing, it's one of the things I loved doing most in school, but never made much time for while I was working. Now I had the time. Once I picked it back up again there was something in me that sparked. I was having a BLAST. That razorback you see down there was the first one I did. 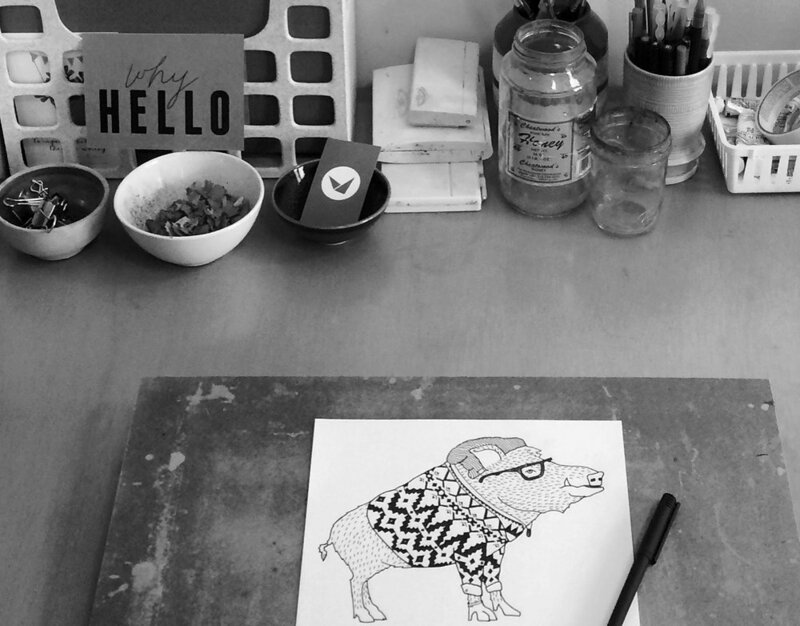 After him I made a series of animals dressed like hipsters and called them hipstanimals. They were silly and fun and I decided other people might think so too. So I opened an Etsy shop and sold a few. And there you have it, folks, the start of May We Fly. It all started with a pig in a sweater. I did eventually end up finding an architecture job at a great place called deMx architecture and had an excellent experience there. I worked there part time for about two years while I kept drawing, and painting, and seeing May We Fly become an actual thing. I also started teaching (and continue to teach) at a local gem called the Community Creative Center, which is a fabulous place where I instruct adult pottery and watercolor classes. October of 2016 is when I took the leap, left my architecture job, and decided to pursue May We Fly as a real, live, artist. In February of 2017 I opened my studio shop (a post more about that coming soon), and now, here we are! I get a lot of questions about the name, and I wish I had a good story for it. I really need to just make one up. But the truth of it is, the name popped into my head one day and I liked it. I tell people that in a way, the business is growing into the name, kind of like we all grow into our own names. What I do know is that the "We" is the most important part. It's the reason I'm here writing a blog, creating my artwork, teaching my students, and doing what I'm made for. So again, thank you for being part of this, and for actually making it to the end of my first blog post. More to come!